? The world's first! Correspondence / ? regard to your order to 360 ° action camera ? 16.38 megapixel BSI CMO sensor ? Full HD shooting 1920 × 1080 (30P), I need your help by one per person. Multiple purchase please refrain. ? such as your order by changing the name at the same address, if we receive multiple orders from the customer, which seems to be the same, please understand that it may be allowed to cancel your order. Kit includes: ? 1) Kodak PixPro AZ651 Astro Zoom Wi-Fi Digital Camera ? 2) Transcend 32GB SecureDigital (SDHC) 300x UHS-1 Class 10 Memory Card ? 3) Vivitar 3-Piece Multi-Coated HD Filter Set (52mm UV/CPL/ND8) ? 4) Precision Design PD-MBP ILC Digital Camera Sling Backpack ? 5) Precision Design PD-T14 Flexible Compact Camera Tripod ? 6) Precision Design HDMI to Micro-HDMI (D) Gold A/V Cable (6 ft/1.8m) ? 7) Precision Design SD/SDHC & MicroSD HC Card Reader ? 8) Precision Design 5-Piece Camera & Lens Cleaning Kit ? 9) Precision Design SD/MicroSD Memory Card Case ? 10) Precision Design LCD Screen Protectors ? 11) Image Recovery SoftwareThe Kodak PixPro AZ651 Astro Zoom Digital Camera offers an astounding 65x optical zoom and so much more. With a top-notch 20MP BSI CMOS sensor, 5 FPS multi-burst, 24mm wide-angle lens and large, 3-inch articulating LCD, photos and videos are crystal clear with amazing, razor sharp detail. Share your moments instantly with your friends and family via Wi-Fi connectivity for even more flexibility.Take more high-resolution pictures faster (up to 45MB/sec.) with this Transcend 32GB SecureDigital (SDHC) 300x UHS-1 Class 10 Memory Card.This Vivitar 3-Piece Multi-Coated HD Filter Set contains a variety of multi-coated glass filters that will optimize your photography experience, and protect your lenses from scratches and dust. Includes UV (ultraviolet), CPL (circular polarizer), ND8 (neutral density) filters and filter case.The Precision Design PD-MBP ILC Digital Camera Mini Sling Backpack is designed to accommodate mirrorless interchangeable lens digital cameras with a standard zoom lens attached.The Precision Design PD-T14 Flexible Compact Tripod features three strong, flexible legs with soft foam padding and rubber feet that can be bent and twisted to fit nearly any surface. The single Waterproof Housing for the SP360 4K, allows for maximum 360 Degreex235 Degree photo and video resolution underwater in all SP360 4K viewing and recording modes. Waterproof up to 30 meters, this housing is ideal for diving, snorkeling, swimming, water and board sports, as well as most any underwater filming scenario you can come up with. Kit includes: ? 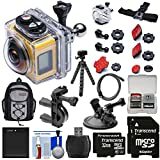 1) Kodak PixPro SP1 Action Camera - Aqua Sport Pack ? 2) Transcend 32GB microSDHC 300x UHS-1 Class 10 Memory Card with Adapter ? 3) Additional Transcend 32GB microSDHC 300x UHS-1 Class 10 Memory Card with Adapter ? 4) Vivitar Car Suction Cup Mount ? 5) Vivitar Bike Handlebar Mount ? 6) PD-MBP ILC Digital Camera Sling Backpack ? 7) PD-T14 Flexible Compact Camera Tripod ? 8) PD HDMI to Micro-HDMI (D) Gold A/V Cable (6 ft/1.8m) ? 9) PD SD/SDHC & MicroSD HC Card Reader ? 10) PD 5-Piece Camera & Lens Cleaning Kit ? 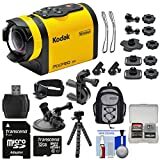 11) PD SD/MicroSD Memory Card CaseRugged, compact and ultra versatile, the Kodak PixPro SP1 Digital Action Cam easily mounts to just about anything else can imagine. Capture all your adrenaline-filled adventures in Full 1080p HD video with an ultra wide-angle lens and 14MP CMOS sensor. Waterproof up to 33 feet (10m) and shockproof up to 6.5 feet, this action cam goes where others can't. With built-in wireless connectivity, sharing couldn't be easier. Additional features: 10fps burst shooting; face detection; underwater white balance; plus more! The included Aqua Sport Pack comes with two base plates, two tethers, two extended arms, two curved/flat adhesive mounts, a surfboard mount and a head strap.Take more high-resolution pictures faster with this 32GB High-Capacity microSDHC 300x Class 10 UHS-1 memory card with included SD Adapter.The Vivitar Pro Series Suction Cup Mount is made to work in conjunction with your action camera securely mounts to virtually any smooth, flat surface.The Vivitar Pro Series Bike Handlebar Mount allows users to securely mount their action camera to handlebars of various sizes.The PD-MBP ILC Digital Camera Mini Sling Backpack is designed to accommodate mirrorless interchangeable lens digital cameras with a standard zoom lens attached. This RF Remote Control w/Nylon Wrist Strap, allows you to easily control a single or multiple SP360 4K VR cameras (*up to 5). Accessory includes nylon wrist strap and a single battery. Kit includes: ? 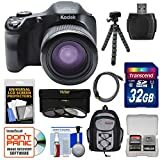 1) Kodak PixPro AZ525 Astro Zoom Wi-Fi Digital Camera ? 2) Transcend 32GB SecureDigital (SDHC) 300x UHS-1 Class 10 Memory Card ? 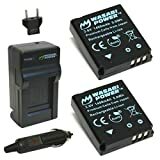 3) Spare NP-40 Battery for Casio / Kodak LB-060 ? 4) Battery Charger for Casio NP-40 ? 5) Vivitar 52mm UV Glass Filter ? 6) Precision Design 50" PD-50PVTR Compact Travel Tripod ? 7) Precision Design PD-C15 Digital Camera/Camcorder Case ? 8) Precision Design SD/SDHC & MicroSD HC Card Reader ? 9) Precision Design 5-Piece Camera & Lens Cleaning Kit ? 10) Precision Design 8 SD / 2 MicroSD Memory Card Case ? 11) Precision Design Universal LCD Screen Protectors ? 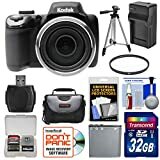 12) ImageRecall Digital Image Recovery SoftwareThe Kodak PixPro AZ525 Astro Zoom Digital Camera offers all the power and performance you could wish for in one cutting-edge, mega-zoom bridge camera. Amazing detail, plenty of features and 52x optical zoom that gets you up close are just the beginning. With a top-notch 16 megapixel BSI CMOS sensor, 6 FPS burst, 24mm wide-angle lens and a large, 3-inch LCD, photos and videos are crystal clear with amazing, razor sharp detail. Share your moments instantly with your friends and family via Wi-Fi connectivity for even more flexibility.Take more high-resolution pictures faster (up to 45MB/sec.) with this Transcend 32GB SecureDigital (SDHC) 300x UHS-1 Class 10 Memory Card.Increase your shooting capacity with this powerful NP-40 Lithium-ion rechargeable battery. Lightweight and sturdy, this Precision Design 50-inch Compact Tripod is ideal for keeping your camera steady in nearly any location, allowing you to capture crisp, clear, steady images with ease.This Precision Design Deluxe Padded Carrying Case is designed to protect ultra-zoom digital cameras and mirrorless interchangeable lens cameras, plus a spare lens and accessories. Kit includes: ? 1) Kodak PixPro SP1 Video Action Camera Camcorder - Aqua Sport Pack ? 2) Transcend 32GB microSDHC 300x UHS-1 Class 10 Memory Card with Adapter ? 3) Vivitar Pro Series Bike Handlebar Mount ? 4) Vivitar Pro Series Car Suction Cup Windshield Mount ? 5) PD-MBP ILC Digital Camera Mini Sling Backpack ? 6) PD-T14 Flexible Compact Camera Mini Tripod ? 7) PD SD/SDHC & MicroSD HC Card Reader ? 8) PD 5-Piece Camera & Lens Cleaning Kit ? 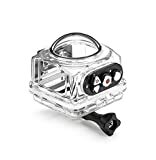 9) PD SD/MicroSD Memory Card CaseRugged, compact and ultra versatile, the Kodak PixPro SP1 Digital Action Cam easily mounts to helmets, boards, handlebars and just about anything else you can imagine. Capture all your adrenaline-filled adventures in Full 1080p HD video with an ultra wide-angle lens and 14MP CMOS sensor. Waterproof up to 33 feet (10m) and shockproof up to 6.5 feet, this action cam goes where others can't. With built-in wireless connectivity, sharing couldn't be easier. Additional features: 10fps burst shooting; face detection; auto exposure; underwater white balance; plus more! The included Aqua Sport Pack comes with two base plates, two tethers, two extended arms, two curved/flat adhesive mounts, a surfboard mount and a head strap.Take more high-resolution pictures faster with this 32GB High-Capacity microSDHC 300x Class 10 UHS-1 memory card with included SD Adapter.The Vivitar Bike Handlebar Mount allows users to securely mount their action camera to handlebars of various sizes.The Vivitar Suction Cup Mount is made to work in conjunction with your action camera. Just attach the camera to the mount and secure it to virtually any smooth, flat surface.The Precision Design PD-MBP ILC Digital Camera Mini Sling Backpack is designed to accommodate mirrorless interchangeable lens digital cameras with a standard zoom lens attached, plus numerous accessories. Kit includes: ? 1) Kodak PixPro AZ651 Astro Zoom Wi-Fi Digital Camera ? 2) Transcend 32GB SecureDigital (SDHC) 300x UHS-1 Class 10 Memory Card ? 3) Vivitar 52mm UV Glass Filter ? 4) Precision Design 50" PD-50PVTR Compact Travel Tripod ? 5) Precision Design PD-C15 Digital Camera/Camcorder Case ? 6) Precision Design SD/SDHC & MicroSD HC Card Reader ? 7) Precision Design 5-Piece Camera & Lens Cleaning Kit ? 8) Precision Design 8 SD / 2 MicroSD Memory Card Case ? 9) Precision Design Universal LCD Screen Protectors ? 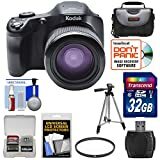 10) ImageRecall Digital Image Recovery SoftwareThe Kodak PixPro AZ651 Astro Zoom Digital Camera offers an astounding 65x optical zoom and so much more. With a top-notch 20 megapixel BSI CMOS sensor, 5 FPS multi-burst, 24mm wide-angle lens and large, 3-inch articulating LCD, photos and videos are crystal clear with amazing, razor sharp detail. Share your moments instantly with your friends and family via Wi-Fi connectivity for even more flexibility.Take more high-resolution pictures faster (up to 45MB/sec.) with this Transcend 32GB SecureDigital (SDHC) 300x UHS-1 Class 10 Memory Card.The Vivitar UV Filter is a multi-purpose glass filter that is designed to block out unwanted ultraviolet light and prevents the UV "fogging/haze" effect, which can result in inaccurate color and lower the apparent sharpness.Lightweight and sturdy, this Precision Design 50-inch Compact Tripod is ideal for keeping your camera steady in nearly any location, allowing you to capture crisp, clear, steady images with ease.This Precision Design Deluxe Padded Carrying Case is designed to protect ultra-zoom digital cameras and mirrorless interchangeable lens cameras, plus a spare lens and accessories. Constructed with closed-cell foam and rugged nylon materials, this case offers great protection and durability. This plastic lens cover fits over your SP360 4K VR Camera lens to help guard against dirt, dust and scratches while using the camera in the Standard Housing or alone. This item includes (1) plastic lens cover and a black lens cover cap. Kit includes: ? 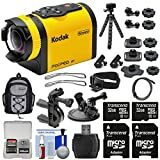 1) Kodak PixPro SP360 Wi-Fi HD Action Camera - Aqua Sport Pack ? 2) Transcend 32GB microSDXC 300x UHS-1 Class 10 Memory Card with Adapter ? 3) Additional Transcend 32GB microSDHC 300x UHS-1 Class 10 Memory Card with Adapter ? 4) Spare Battery LB-080 for Kodak ? 5) Vivitar Car Suction Cup Mount ? 6) Vivitar Bike Handlebar Mount ? 7) PD-MBP ILC Digital Camera Sling Backpack ? 8) PD-T14 Flexible Compact Camera Tripod ? 9) PD HDMI to Micro-HDMI (D) Gold A/V Cable (6 ft/1.8m) ? 10) PD SD/SDHC & MicroSD HC Card Reader ? 11) PD 5-Piece Camera & Lens Cleaning Kit ? 12) PD SD/MicroSD Memory Card CaseCapture perspectives as unique as your adventures with the Kodak PixPro SP360 Action Camera with Aqua Sport Pack. 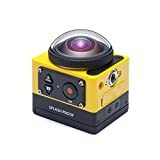 Using a unique dome-shaped fixed lens, this camera offers several views including a full circular fisheye view, a 360-degree panorama mode, and a dual front 180-degree and rear 180-degree mode that's great for capturing your POV as well as your reactions with a single camera. It also features a compact and rugged design that is 14-degrees F freezeproof, shockproof from falls up to 6.5 feet, dustproof, and splash resistant. The included Aqua Sport Pack provides a waterproof housing rated to 197 feet (60m), two curved/flat adhesive mounts, surfboard mount, head strap and two extended arms.Take more high-resolution pictures faster with this 32GB High-Capacity microSDXC 300x Class 10 UHS-1 memory card with included SD Adapter.Increase your shooting capacity with this powerful LB-080 Lithium-ion rechargeable battery.The Vivitar Suction Cup Mount is made to work in conjunction with your action camera and securly mounts to virtually any smooth, flat surface.The Vivitar Bike Handlebar Mount allows users to securely mount their action camera to handlebars of various sizes. The Standard Housing for the SP360 4K is an open framed, lightweight housing, that allows for maximum 360 Degree photo and video resolution. Use this lightweight housing and open design makes your SP360 4K more accessible with more mount options than ever before.